Forty-three states, Washington D.C. and Puerto Rico all operate their own lottery systems. Sometimes the prizes offered by state lotteries reach more than $100 million, such as the 2002 California $193 million lottery jackpot. If your state is giving away a huge jackpot, you can throw a lottery-based party in the hopes one of your guests will win. Even if no one wins any money, your guests can play lottery and casino games for entertainment purposes and non-cash prizes. Hold the party on a night that your state is holding a multi-million-dollar lottery drawing. Purchase tickets in advance, buying enough tickets for each of your guests to have one. Purchase or make your own “lottery” tickets. You can give these to your guests along with the actual lottery tickets. Make duplicates of each ticket and place them inside a giant box, preferably one you decorated in gold glitter; you could also use an old shipping trunk that lookslike a treasure chest. Cover the tables with your green velvet tablecloths and decorate the center of the table with a few gold votives surrounded by chocolate gold coins, a pair of dice and an opened deck of cards. At every table setting, place a party bag filled with one state lottery ticket, one of your fake tickets, scratch-off tickets, a few pennies to use on the tickets, fake dollar bills and plastic gambling chips. Tape a green ticket beneath one chair, which you should choose at random. Dress the hostess as Lady Luck in a long, green gown accessorized with gold jewelry and fake baubles. If a couple is hosting the party, dress Lady Luck’s counterpart as a high roller, complete with tuxedo suit and bowtie, a green scarf and a green ribbon-wrapped fedora. Tuck a fake $100 bill inside the fedora’s ribbon to complete the look. Ask other party goers to dress in their finest casino wear. Make a bunch of “lucky” boas by stringing a ton of fake crumbled dollar bills together until you have a three- to four-foot long boa. Pass them out to guests as they enter the party. Serve your guests fancy, but not messy, finger foods and champagne. 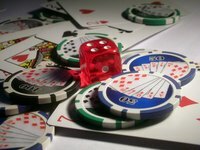 Entertain your guests with casino card games and dice games such as craps. Tune in to the lottery broadcast when it airs. Loudly cheer any winners. Once the broadcast is finished, hold your drawing and distribute prizes to any winners. Tell all the guests to search beneath their chairs; whoever has the green ticket should win the largest prize of the night. Allow your guests to cash in their remaining plastic chips for small prizes at the end of the evening or as they leave the party.